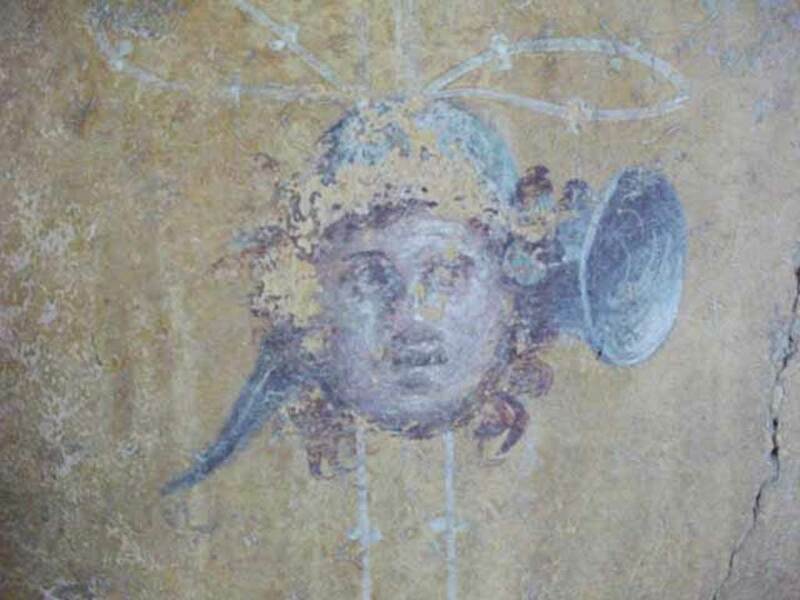 I.10.4 Pompeii. 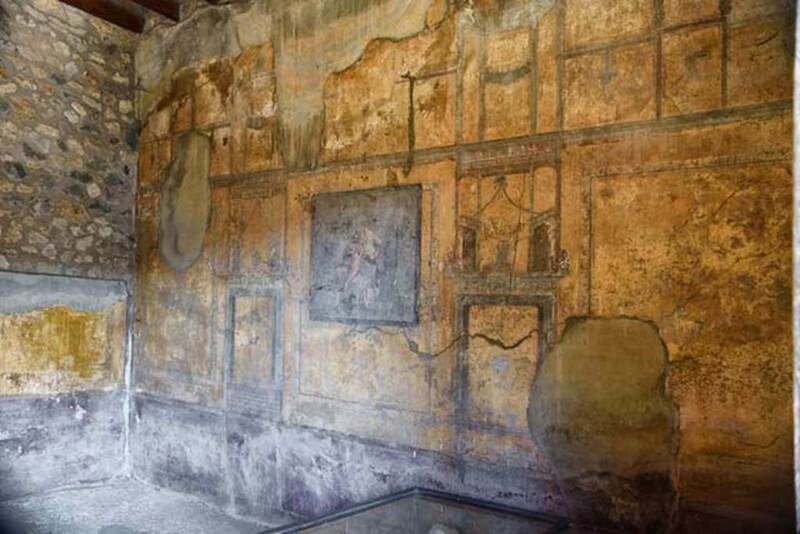 Casa del Menandro or House of the Menander or House of the Silver Treasure. 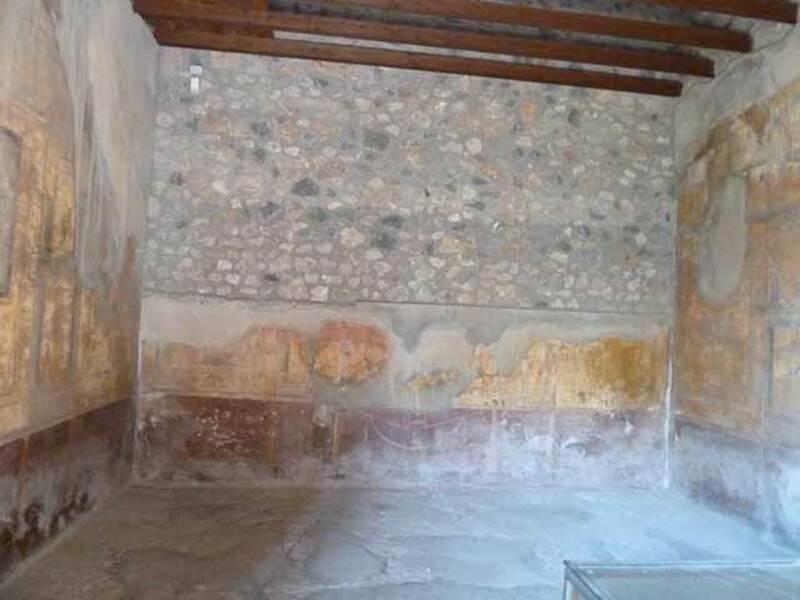 I.10.4 Pompeii. May 2006. East portico, looking north. 1.10.4 Pompeii. May 2015. Room 19, north wall with doorway to room 18. Photo courtesy of Buzz Ferebee. 1.10.4 Pompeii. May 2012. Room 19, north wall with doorway to room 18. Photo courtesy of Buzz Ferebee. 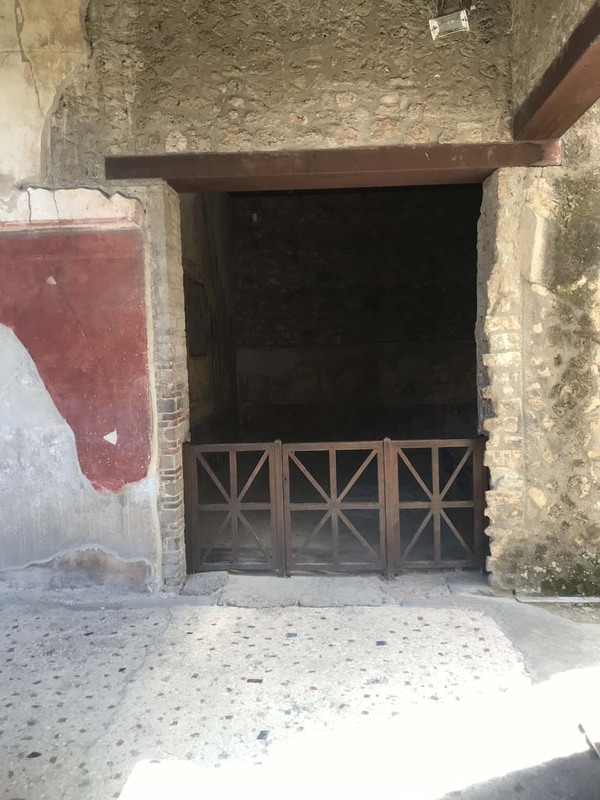 1.10.4 Pompeii. May 2010. Room 19, north wall with doorway to room 18. 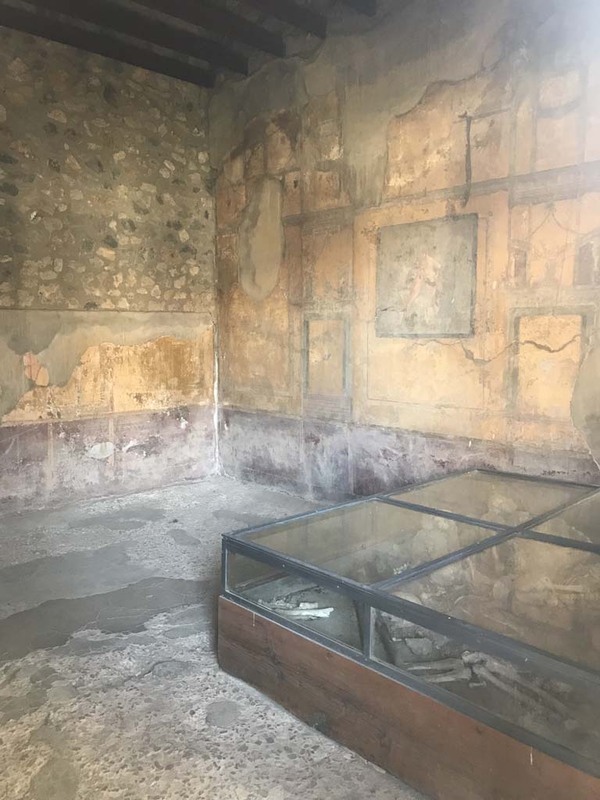 I.10.4 Pompeii. May 2006. Room 19, north wall by the side of doorway to room 18. 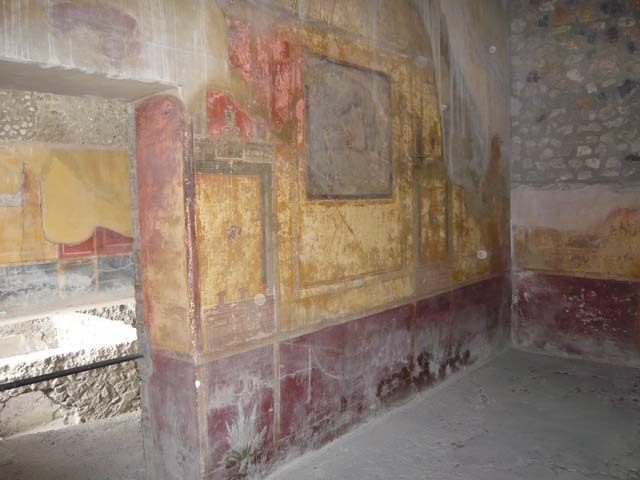 I.10.4 Pompeii. May 2006. Room 19, north wall. 1.10.4 Pompeii. May 2015. 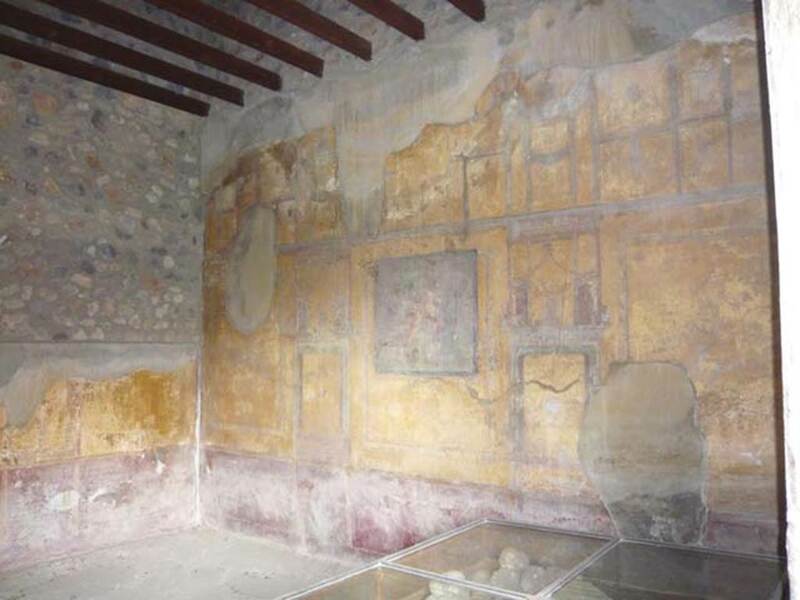 Room 19, central painting on north wall. Photo courtesy of Buzz Ferebee. 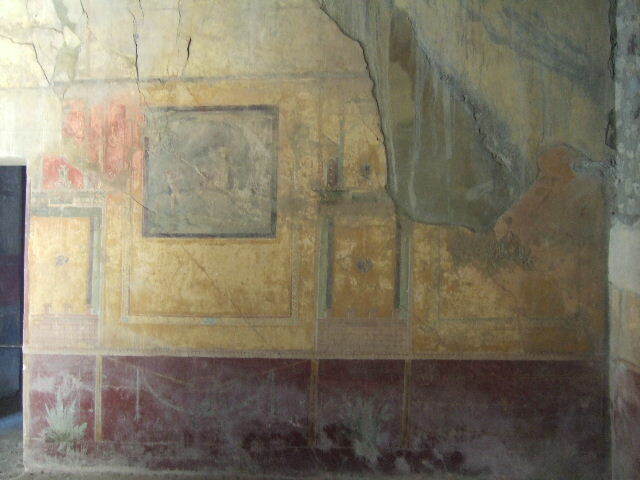 I.10.4 Pompeii. May 2006. Room 19, north wall. 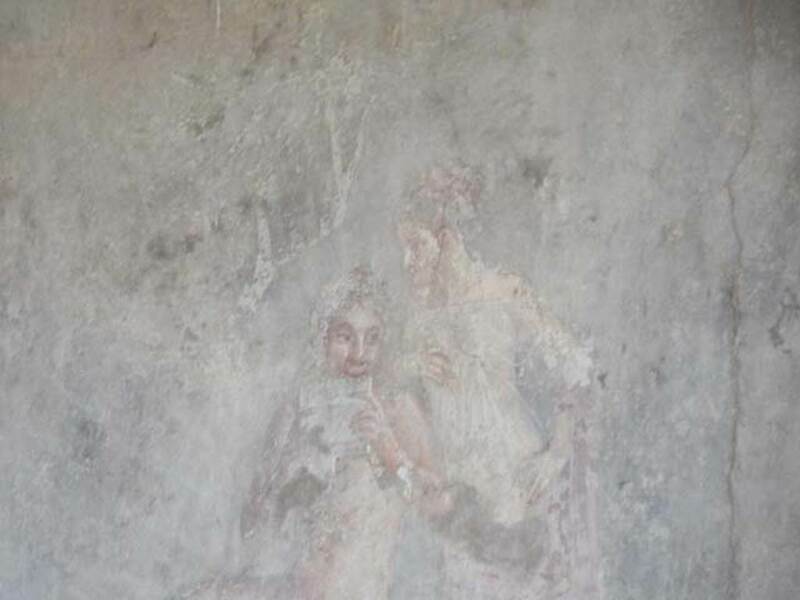 Wall painting of cherub scared by a tragic mask held by a nymph. 1.10.4 Pompeii. May 2010. 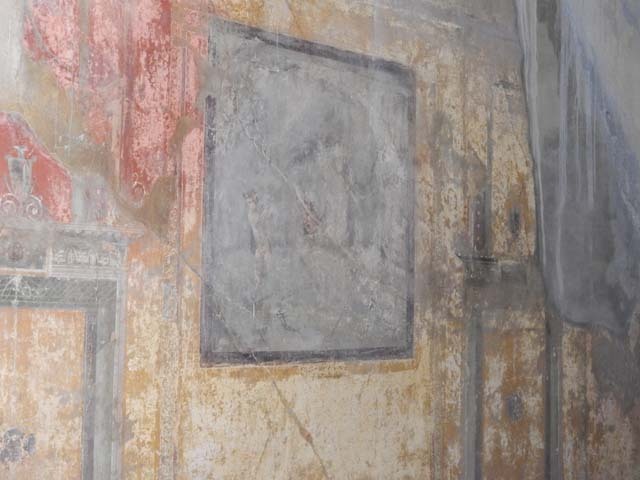 Room 19, east wall. 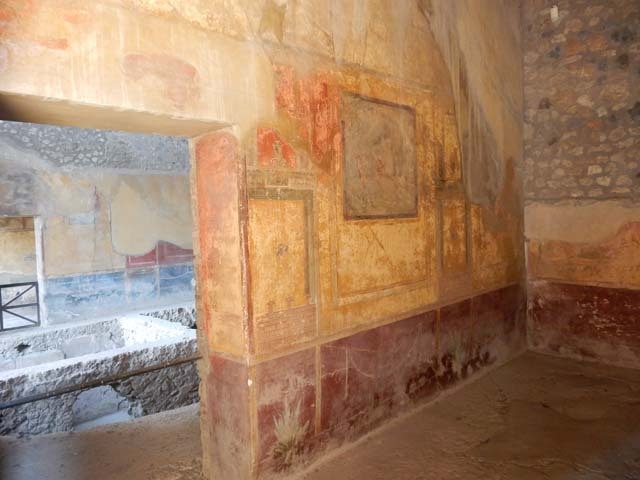 I.10.4 Pompeii. 1966. Room 19, plant on zoccolo (dado) of room on south end of east side. I.10.4 Pompeii. April 2018. Room 19, looking towards south-east corner and south wall. Photo courtesy of Ian Lycett-King. 1.10.4 Pompeii. May 2017. Room 19, looking towards south wall. Photo courtesy of Buzz Ferebee. 1.10.4 Pompeii. May 2015. Room 19, south wall. Photo courtesy of Buzz Ferebee. 1.10.4 Pompeii. May 2012. Room 19, south wall. Photo courtesy of Buzz Ferebee. 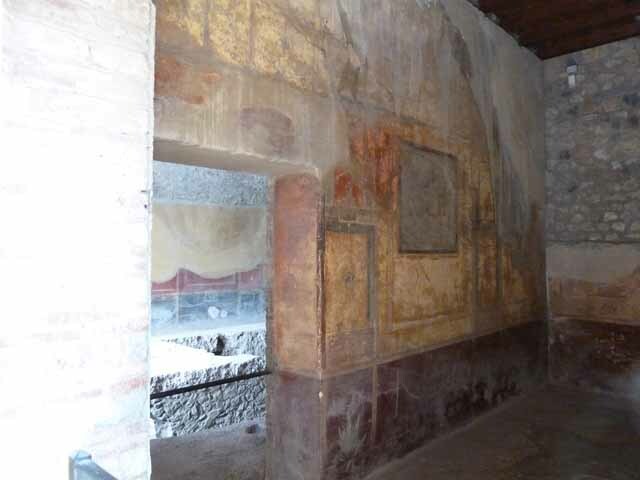 I.10.4 Pompeii. May 2006. Room 19, south wall. 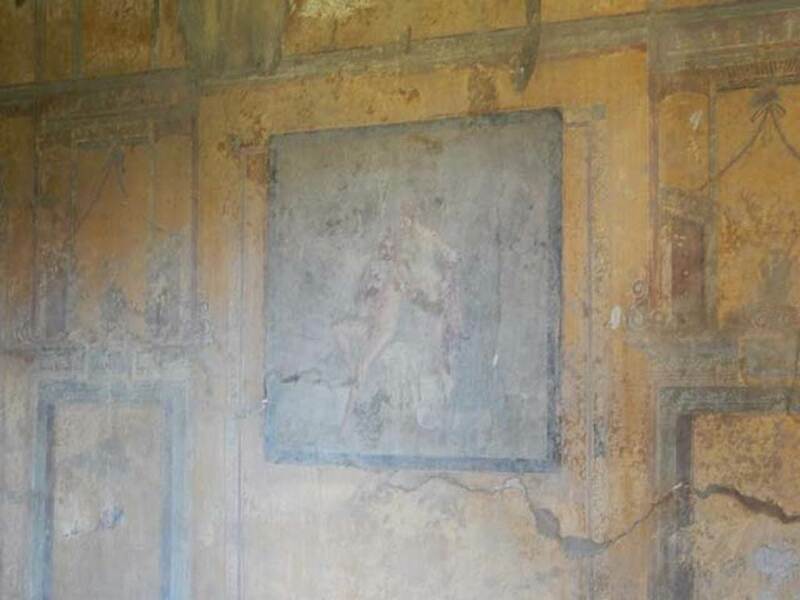 I.10.4 Pompeii. May 2017. Room 19, looking towards south-east corner and south wall from doorway. 1.10.4 Pompeii. May 2017. 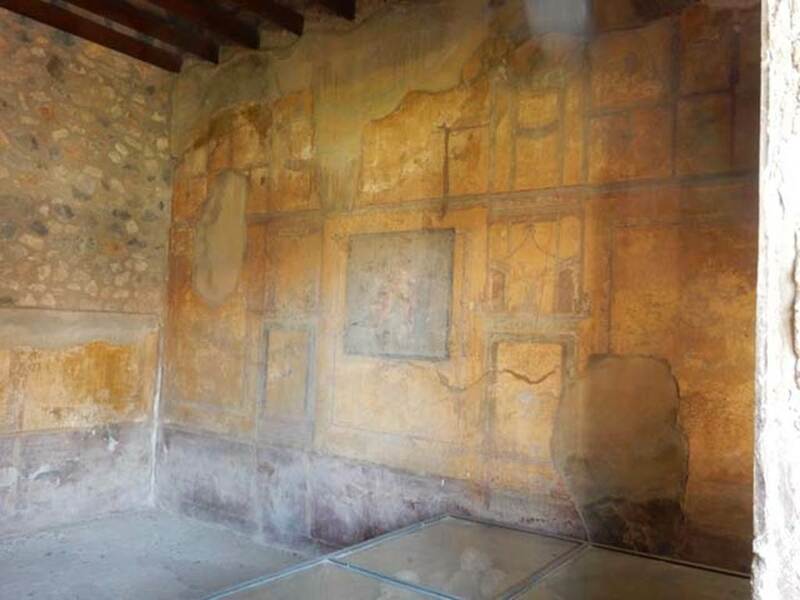 Room 19, central painting from south wall. Photo courtesy of Buzz Ferebee. 1.10.4 Pompeii. May 2015. 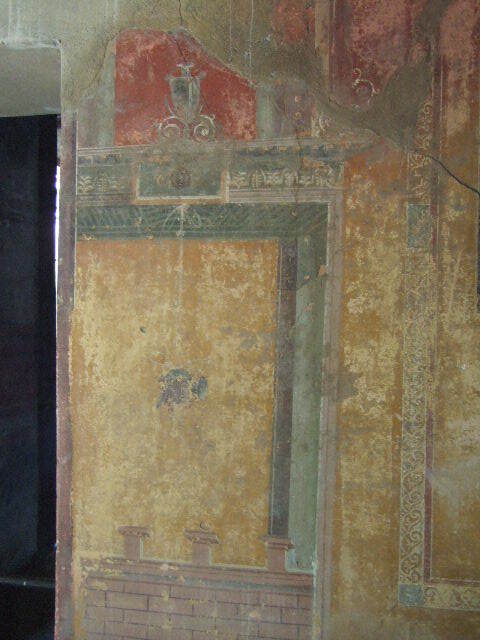 Room 19, central painting from south wall. Photo courtesy of Buzz Ferebee. 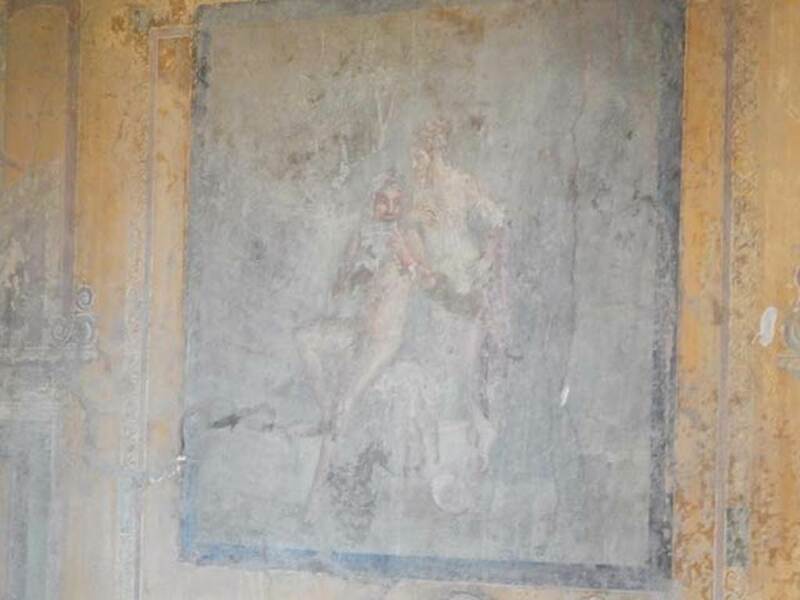 I.10.4 Pompeii. May 2006. Room 19, south wall. 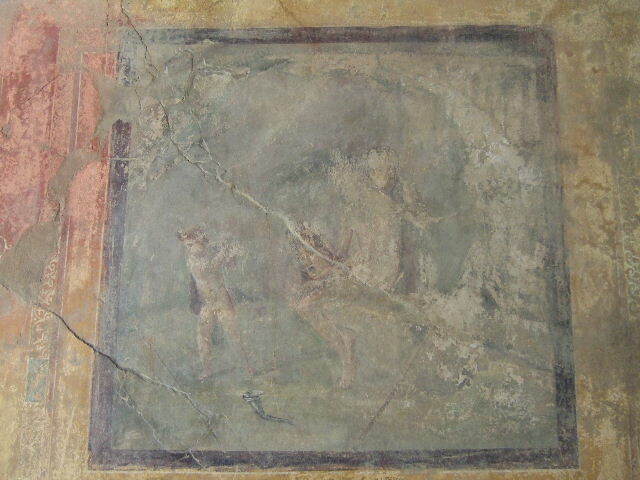 Wall painting of a Satyr playing a flute to a Maenad. 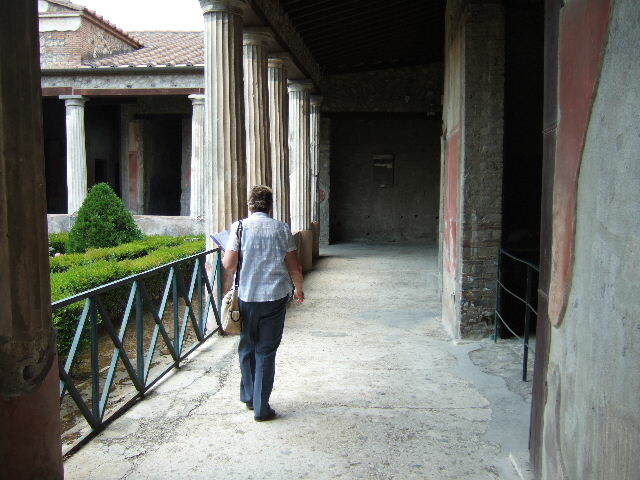 See Ling, Roger: La Casa del Menandro, in Menander, La Casa del Menandro di Pompei. Edited by G. Stefani. Milan: Electa, 2003 (p.39). 1.10.4 Pompeii. May 2015. 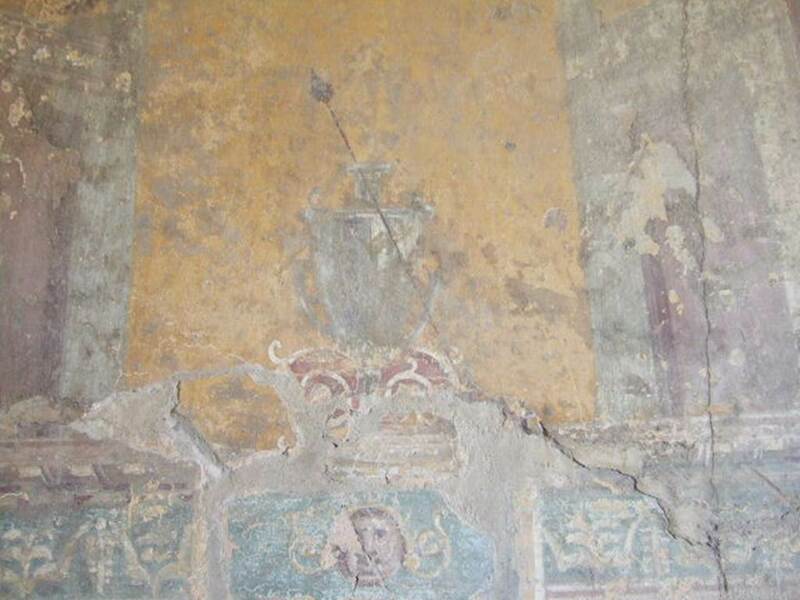 Room 19, detail of central painting from south wall. Photo courtesy of Buzz Ferebee. 1.10.4 Pompeii. May 2010. 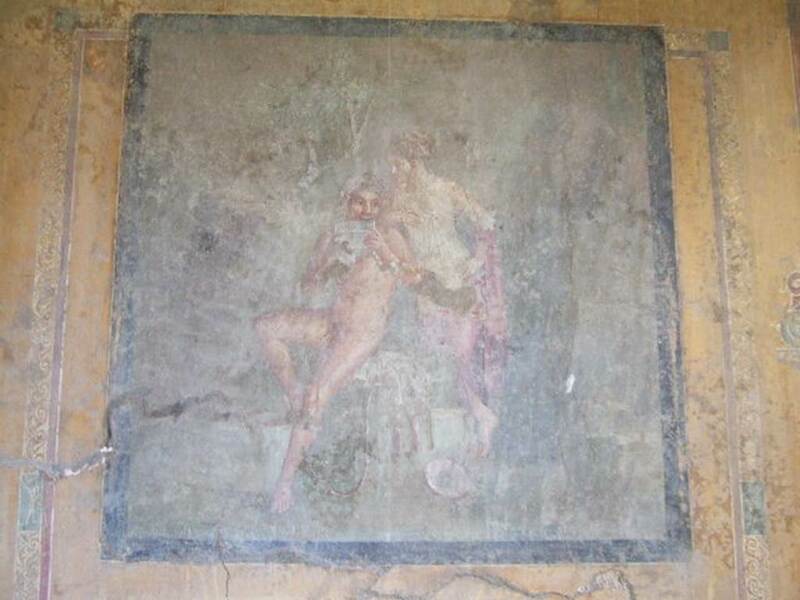 Room 19, detail of Satyr and Maenad. 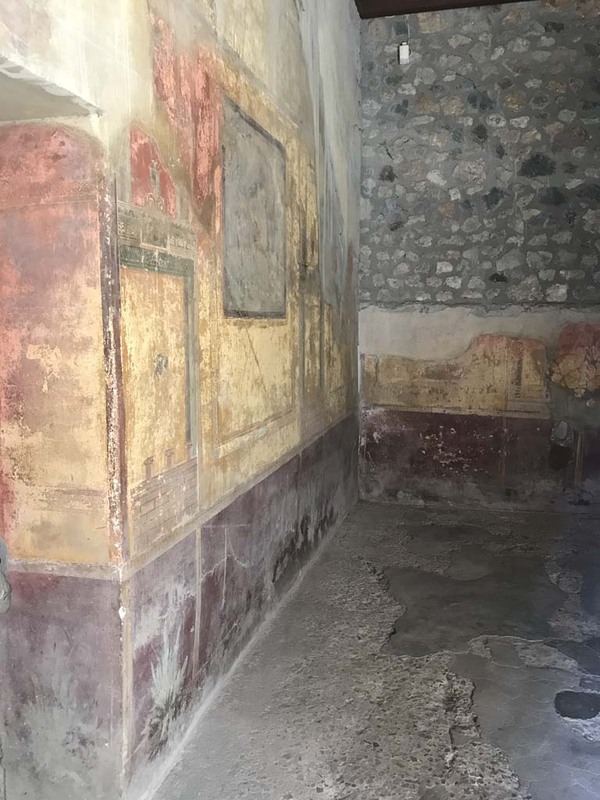 1.10.4 Pompeii. May 2010. 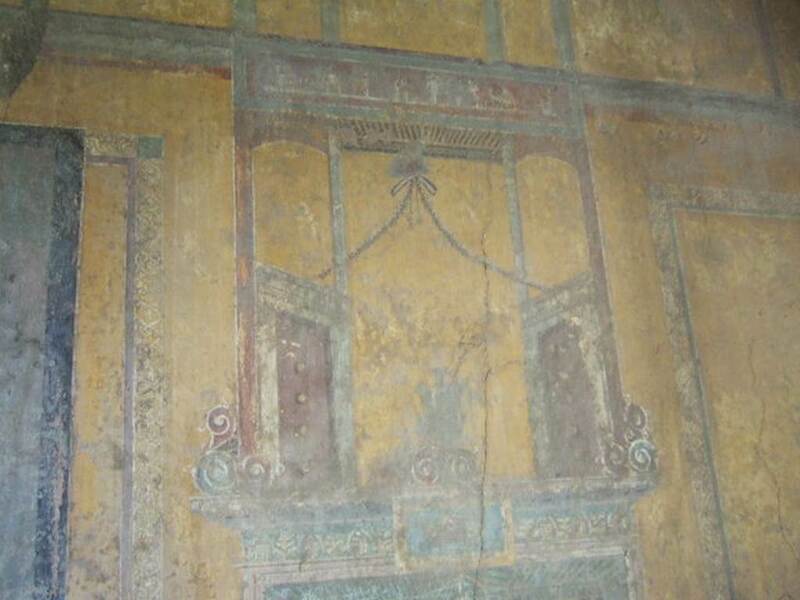 Room 19, detail from south wall. I.10.4 Pompeii. May 2006. Room 19, south wall. 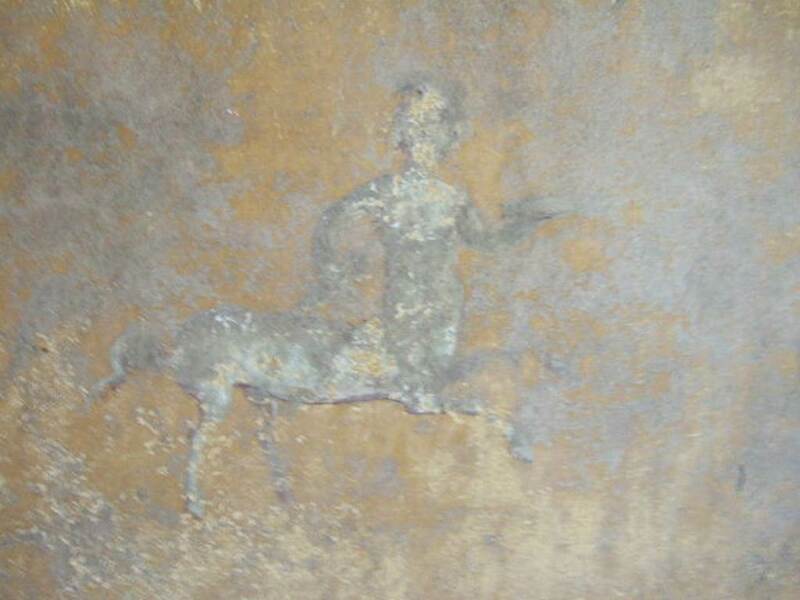 Painted centaur with patera. 1.10.4 Pompeii. May 2015. Room 19, looking south across glass case with remains of bones of fugitives. 1.10.4 Pompeii. May 2010. 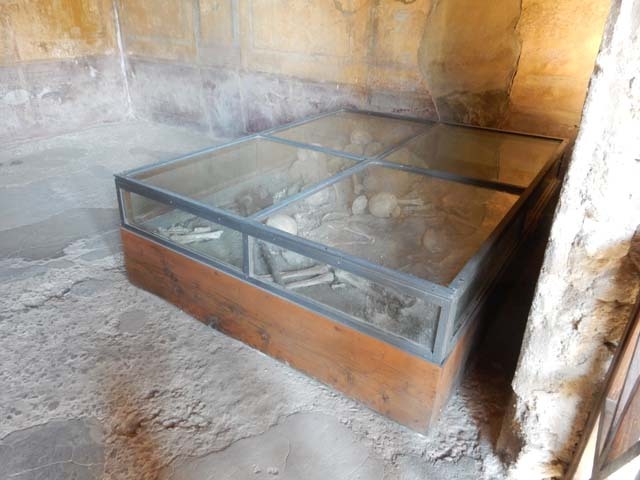 Room 19, glass case with remains of bones of fugitives. 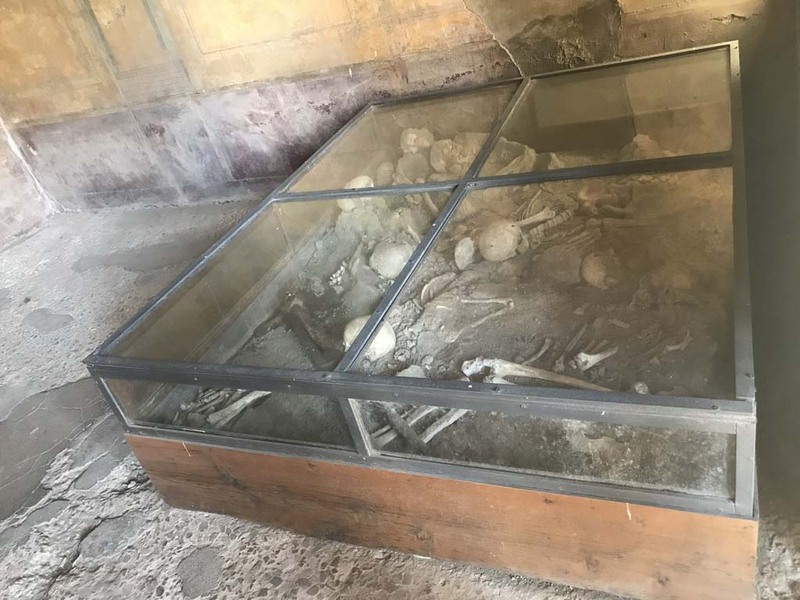 Originally three skeletons were found in room 19 on 29th April 1931 near to the doorway to the peristyle at ground level. Maiuri identified them as two adults and one juvenile. 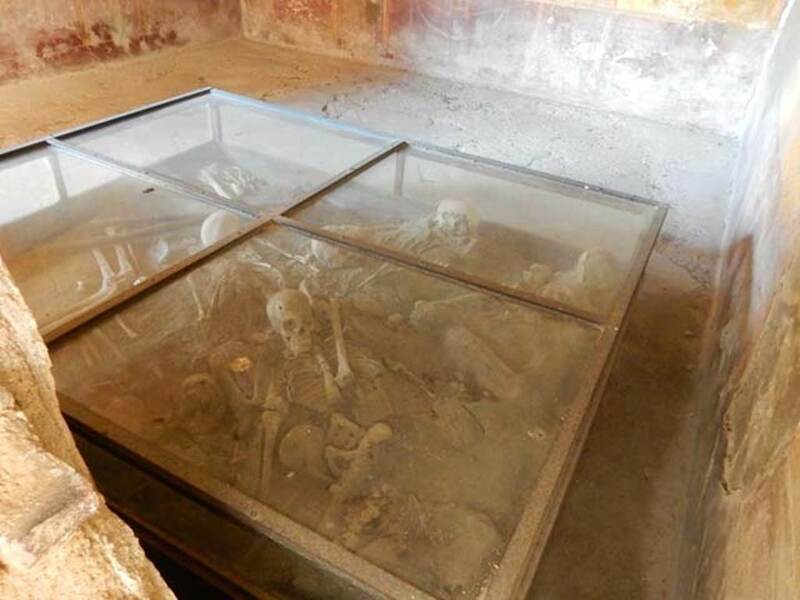 These skeletons were removed. Found with them were a mattock and a pick-axe, perhaps used to make the holes in the south and west walls to help them escape. These tools can be seen in the glass case but with reconstructed wooden handles. 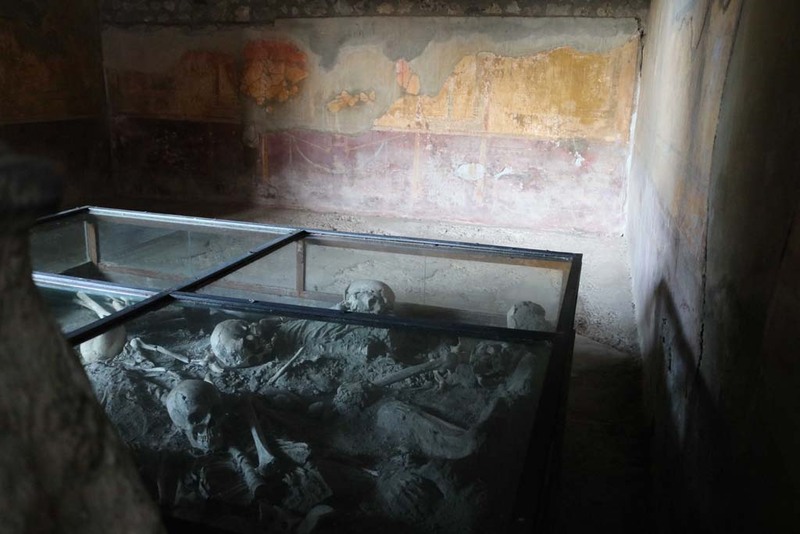 The other skeletons, approximately ten of them, were found a few days later above the corridor P1. They were found 2.5 metres above the ground. They seemed to have fallen from an upper floor, one on top of another, so their bones were intermingled. All of these bones from corridor P1 were collected and moved to Room 19 for display in the glass case. Some of the bones, not needed for the display, can still be seen in a pit in the lower right corner of the photo. 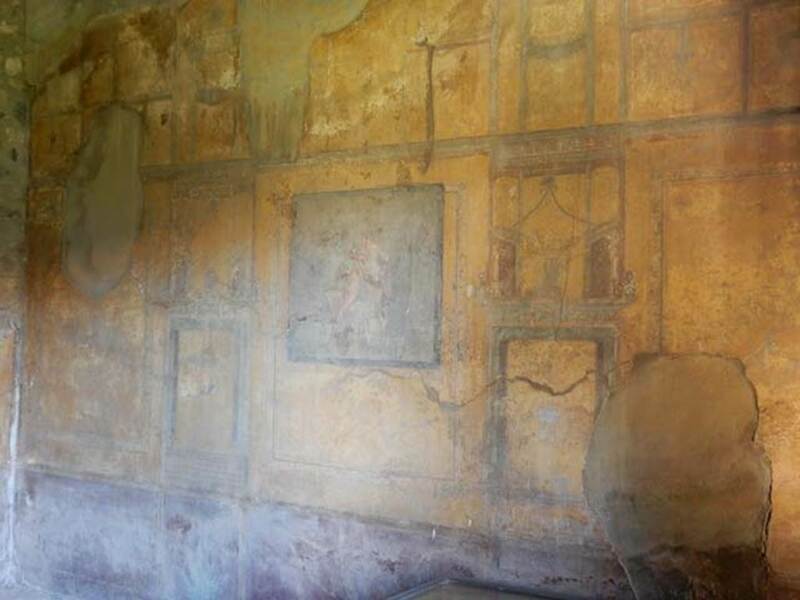 See Lazer, E: Resti umani scheletrici nella Casa del Menandro, in Menander, La Casa del Menandro di Pompei. Edited by G. Stefani. Milan: Electa, 2003 (p. 64-69). 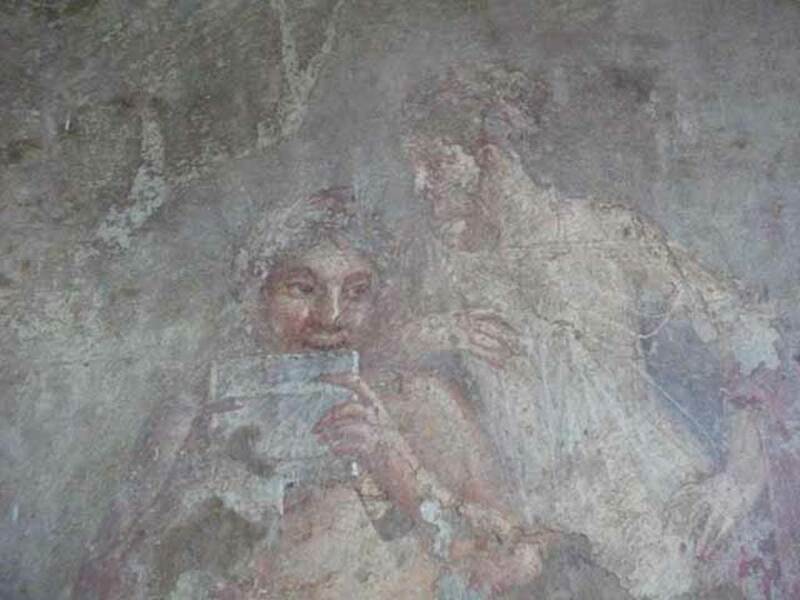 I.10.4 Pompeii. May 2006. 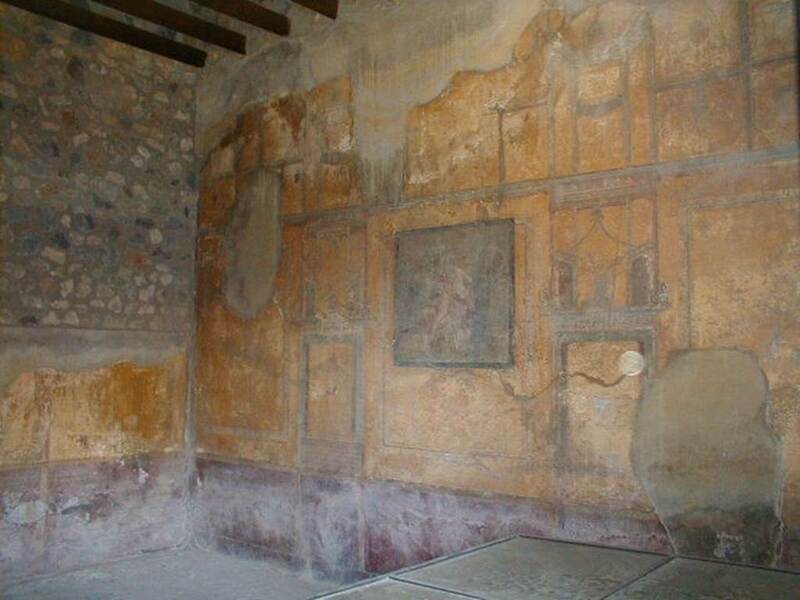 Room 19, west wall. One of the holes, presumably made by the mattock and pick-axe found in this room, can be seen. I.10.4 Pompeii. May 2006. Room 19, skeletons in glass case. I.10.4 Pompeii. May 2017. Room 19, detail of skeletons in glass case. Photo courtesy of Buzz Ferebee. 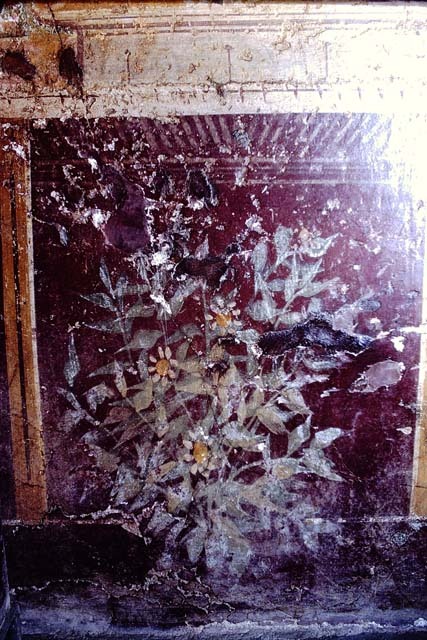 I.10.4 Pompeii. May 2006. Room 19, skeletons, pick-axe and mattock in glass case, with restored wooden handles.